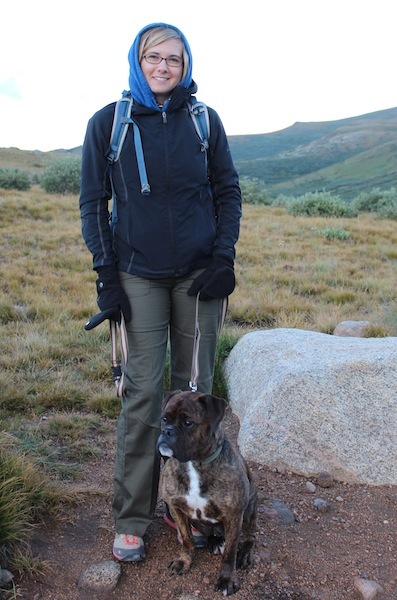 After K’s trip to the concrete jungle of our nation’s capital, she was ready to hike and get some good ole’ Rocky Mountain fresh air. We had everything packed and ready to go for an early Friday morning start. 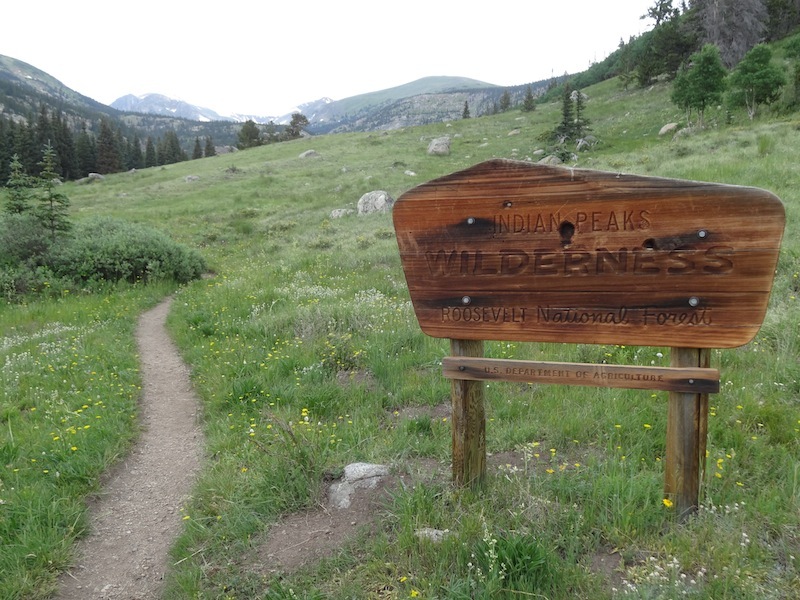 We left the house around 7am and drove up to Nederland and headed into the Indian Peaks Wilderness. This is now one of our new favorite places and we look forward to going back to explore other trails. I am not going to name the trail-head, as we want to keep it a secret location as there is some killer trout fishing in the numerous lakes. We hiked from the dirt parking area, crossed a creek and headed through an old mining town site. There wasn’t anything left of the town, just a historical marker but the wildflowers that were along the trail were awesome. We then crossed another creek before we headed up a very rocky trail. 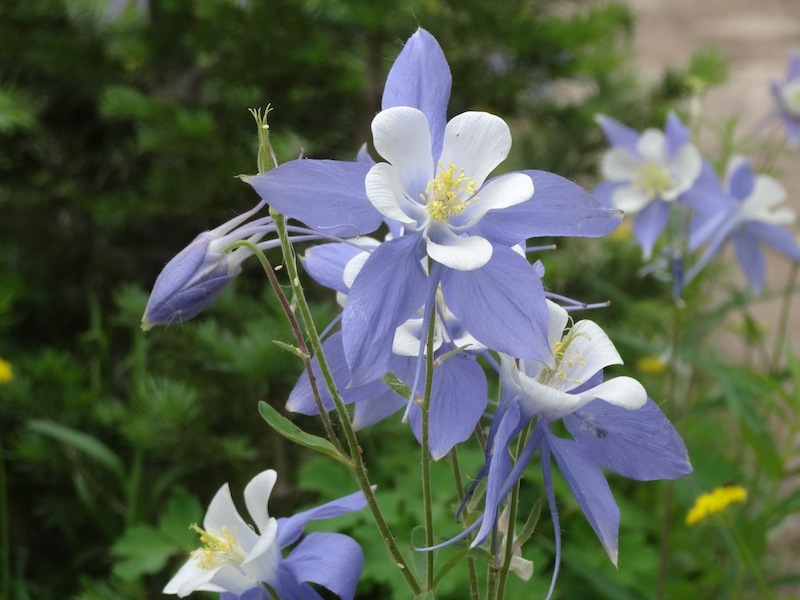 After a few miles the trail opened up into a meadow around 9,800 ft that was loaded with Columbines and Indian Paint Brushes. A few more miles up the trail we came to the lake that was to be our lunch and fishing spot. We broke out the Italian wraps that we made the night before and enjoyed the beautiful view. There was still snow up on the mountains in places and at one point just before the lake there was a snow drift that was at least 10ft tall and its mid July! After eating, I grabbed my fishing gear and headed to the lake. On the third cast I had a small trout on the line. I released him and made my way around the lake pulling one in every third cast or so. I never caught anything big, but it was a lot of fun. I was mesmerized by the fishing action and didn’t notice the clouds moving in. K yelled from across the lake that we needed to get going. “One more cast!” I lost count of how many fish I caught, but this is a spot we will be returning to to camp and fish. We packed up and made our way down the trail. It started raining on us and then the thunder and lightning began to close in. We had to take cover for about 20 minutes before we headed into the open meadow we had crossed earlier. The lightning storm finally moved out and we continued down in the rain. When we got back down to the river, it was overflowing its banks because of how much rain fell in such a short amount of time. It was a fun 10 mile hike even though we got wet. Good thing we came prepared with our rain gear. With a 7am planned departure, we were ahead of the game as we backed out of the garage at 6:45am. A clear blue sky could only mean that a great day of hiking in the Flatirons was in our near future. The trail of the day was Royal Arch Trail in Boulder, with the trailhead located at Chautauqua Park. 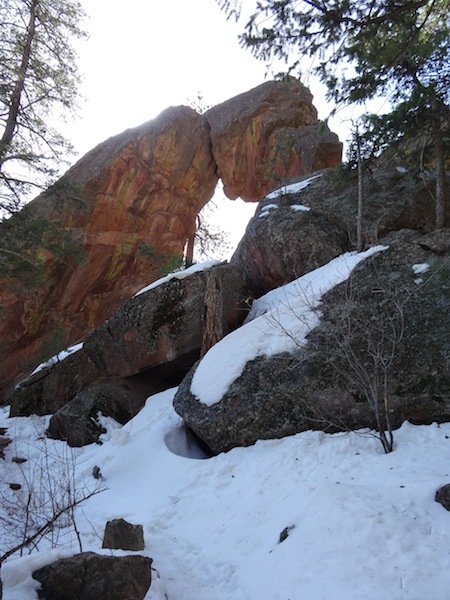 Royal Arch is a short – 3.2 miles roundtrip – but strenuous hike, so we planned to be back in Boulder in time for lunch. Just a few steps into our hike, we spotted ultrarunner, Anton Krupicka. We recognized him from a recent magazine article and TV documentary. Why didn’t I take a picture??!! Our trail began in an open meadow, wondered betwixt the forest, crossed Tangen Spring and finished along steep rocky terrain at our destination – Royal Arch. With much of the trail still icy and snow covered, we were prepared with trekking poles and Microspikes, even though weather at the trailhead was sunny and in the 70s. (Thank you CMC for our excellent training!) The Arch has a 20′ span and looks out over the urban view of Boulder. Directly underneath the Arch was a perfect spot for a morning snack and to enjoy the peaceful view. After enjoying our summit, we headed back down trail. Even though the trail is short, it is a fun and involved hike, especially when icy and muddy. We made good time and arrived at the trailhead before noon. We packed up the Subaru and headed to The Sink to enjoy our well deserved lunch. 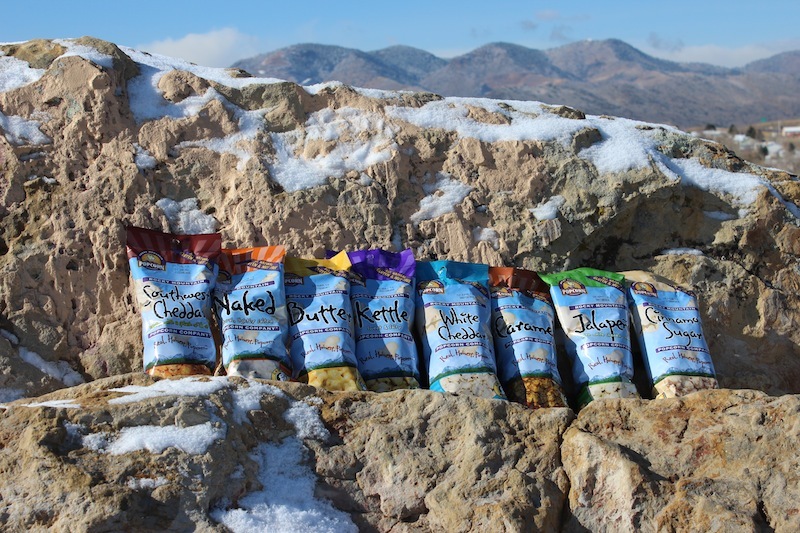 That’s why Rocky Mountain Popcorn has a variety of flavors to satisfy everyone’s snack craving. Just say NO to movie theatre butter popcorn – which could have over 1,000 calories. Say YES to Rocky Mountain Popcorn Butter. The Jalapeno and Southwest Cheddar are delightfully spicy….a little cheese with a little kick. For the traditional popcorn lovers, Naked has just the right amount of salt and flavor. The time-tested flavors of Butter and White Cheddar are two of our favorites. For our readers with a sweet tooth, you must try Caramel and Cinnamon Sugar…just call them dessert. And Kettle is the perfect combination of salty and sweet. If deliciousness isn’t enough to convince you, then how about All Natural and Gluten Free?! Skip the chips, crackers and processed snacks. We love being outdoors and taking along healthy snacks. 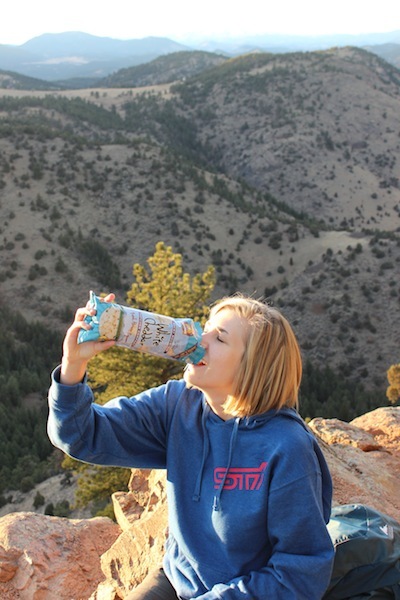 When hiking, popcorn is a great option for on the go and the Grip ‘n Pour size fits nicely in a backpack. So, take a hike and take some Popcorn! Who loves Rocky Mountain Popcorn? Furry B does…And You Will Too! Check out Rocky Mountain Popcorn on Facebook and Twitter. They keep the conversation going with fun, games, discounts and giveaways. 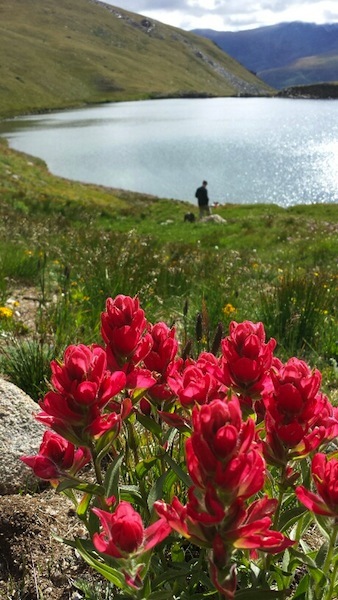 The Colorado Mountain Club is celebrating it’s centennial anniversary this year (1912-2012) and Kristy and I took part in it by joining the 14er Challenge. 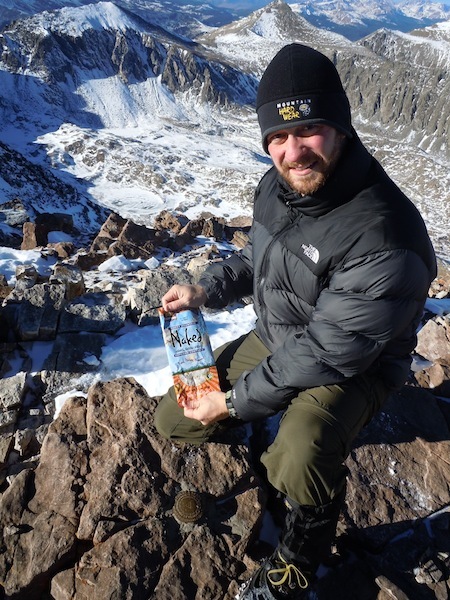 Climbing teams were attempting to ascend all fifty-four 14,000 foot peaks in Colorado on the same day. Team ascent, descent times and progress on the mountains were monitored back at a makeshift climbing headquarters and the teams brought CMC signs and flags for the summit celebrations. Kristy and I signed up to climb a moderately rated Grays Peak at 14,270 feet to join in the fun and be a part of CMC history. Our group started at the Grays Peak trailhead around 8am with temps around 32 degrees. With the help of the outstanding weather, we made pretty good time and a small ambitious team of 4 of us were able to peel off and tackle nearby Torreys Peak at 14,267 feet. We were still able to meet the rest of the group, who stuck to the original route, up on Grays for lunch. This made two 14’er summits in one day completing the Grays-Torreys combo!! Generalized view of the route for the day. 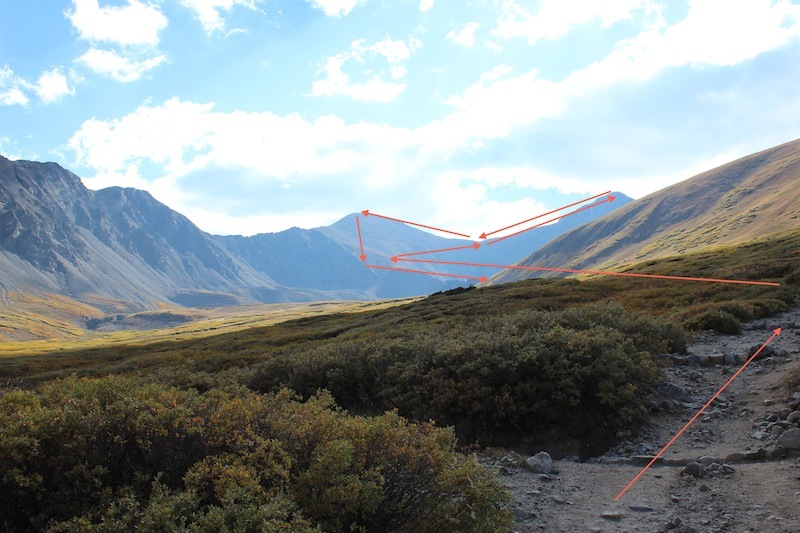 Where the arrow cuts right towards the saddle is where the 4 of us split off to summit Torreys. The other group continued up Grays at this same spot and then we met them for lunch on the Grays summit. 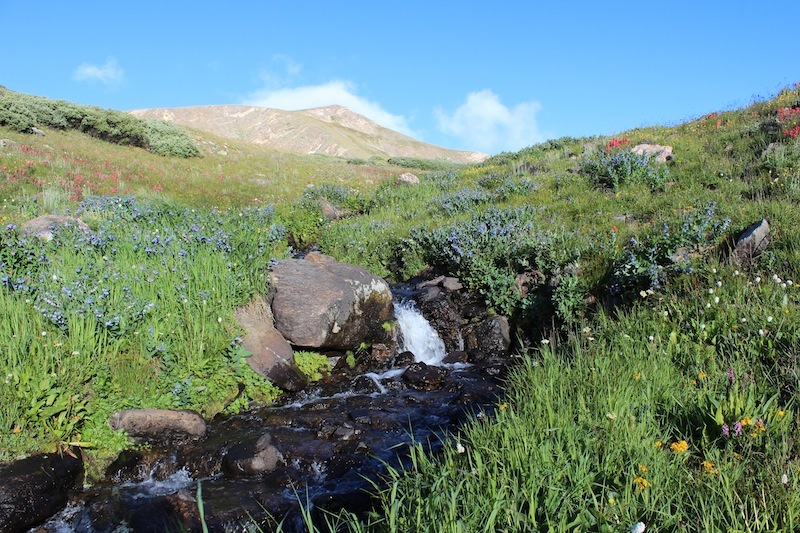 We had perfect temperatures, crystal clear skies and saw some of the best views of the front range all summer. After pictures at the top were taken with the CMC sign, everyone finished up lunch and started the descent. Big thanks to our trip leader, Lorna and the Colorado Mountain Club!! 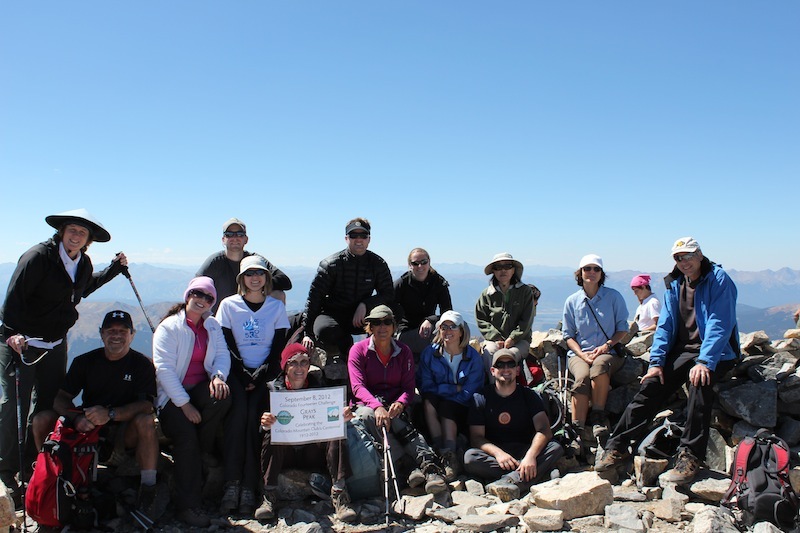 Summit of Grays Peak with the CMC. A great day, with friendly people and amazing views. For the long labor day weekend, we packed the Land Cruiser and the camp trailer and headed to the San Isabel National Forest for an attempt to climb Colorado’s highest peak: Mt Elbert; and to get a way from the masses of Denver. After driving for 2 hours, it was dark when we reached the trailhead, but we managed to find a great camp spot and set up. We immediately climbed into our sleeping bags, as we would get up at 5am and head for the trail. It was a refreshing 34 degrees when we woke up, very welcomed from the 90+ heat wave we have had in Denver. We got our packs ready, ate a quick breakfast and went to the trailhead. We were anticipating a 9+ hour day, so we wanted to get an early start to beat any weather that could show up. It was warming up quick as the sun came up over the distant mountains about an hour into the hike. We have had some haze the last few weeks from the wildfires in Montana and the smoke has slowly made it’s way into Colorado. The views were not as clear as they normally are, but it was still beautiful. 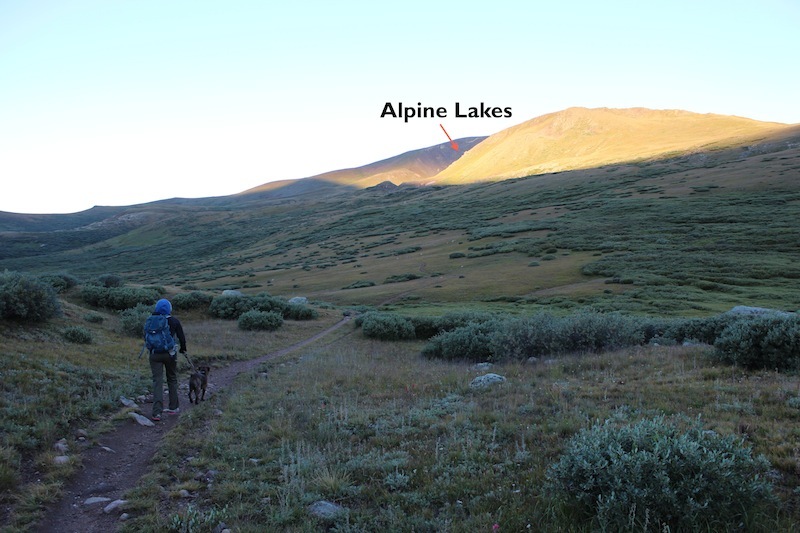 As we left tree line we could see the trail winding steeply up to what looked like the top of Elbert. This was one of two false summits on this side of the mountain. A false summit is when you look up and think you see the summit and when you get there, the actual summit is beyond where you thought. This can be a mind game and frustrating, but you have to keep going. We began noticing the clouds building when we were around 12,500 ft and kept a close watch on them. 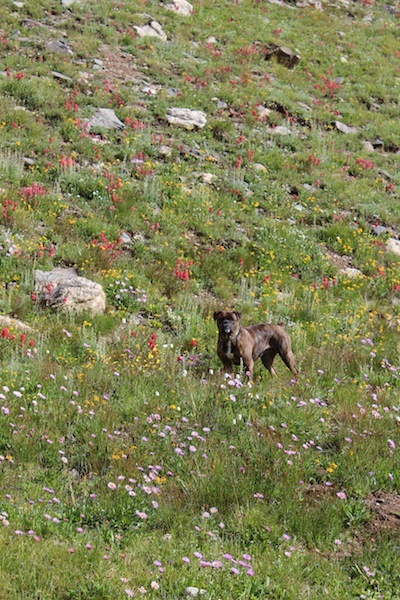 As we neared the 13,150 ft mark, we decided to call it a day and headed back down. When you are above tree line (approx. 12,000 ft) you have no cover and you are at the complete mercy of the elements. The weather can change in an instant in the mountains, so you better be prepared. A week after our summit of Mt Bierstadt, there was a snowstorm, yep, in August… Colorado also has the highest percentage of lighting strikes just after Florida, a lot of these being on the high peaks and you do not want to be at 14,000 ft when a storm comes in. Sure, we were disappointed, but the mountain will always be there and we will be back. As we headed down, we saw darker clouds rolling in and then it would clear, but we still didn’t want to risk it. When we got back to tree line, we stopped for brief lunch and then just enjoyed the rest of the hike back to camp. 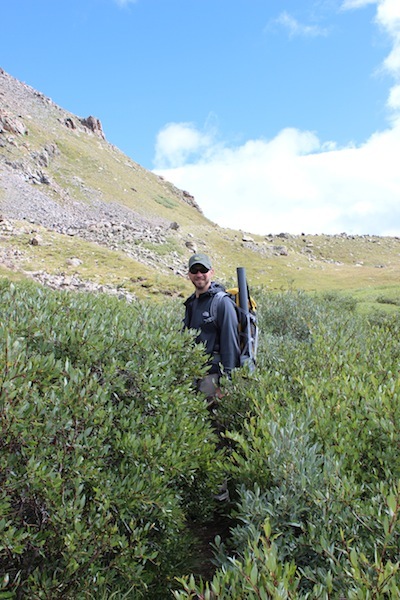 About a half mile from the trailhead, we found an Aspen grove near a creek, so we stopped and took some pictures. When we got back on the trail, we ran into someone heading down and he said it had gotten pretty nasty up top with hail and sleet. This made us feel better about our decision. We shed our packs and took our boots off back in camp and it was time for some burgers and beer. After we ate, the thunder began, so we packed everything up from getting wet, unhooked the trailer and took the Cruiser to do some exploring in the rain. It was brief and didn’t last long, but we found some great trails and really liked the rest of the camping area we didn’t get to see on the way in because it was dark. We will definitely bring the 4wheeler next time we go. 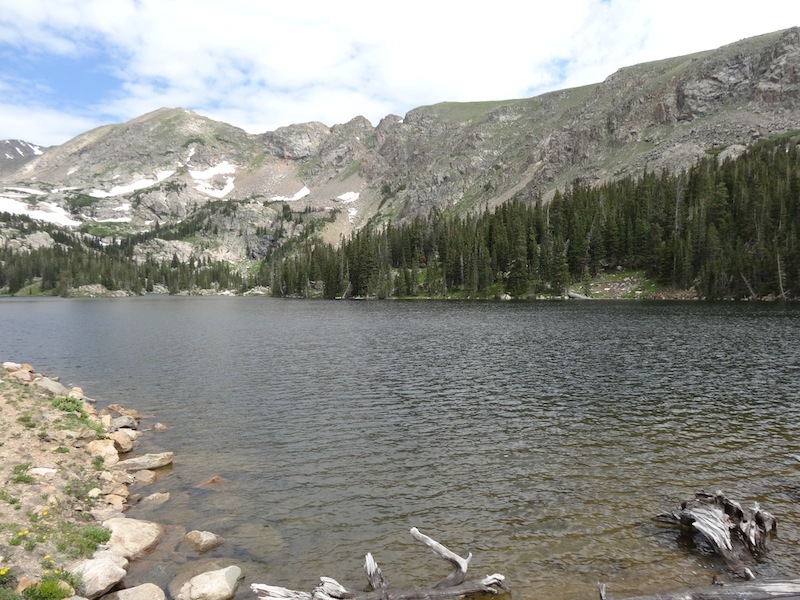 We also found the Mt Massive trailhead, which is CO’s second highest peak at 14,428 ft in the same area. I think we will be visiting this area again and again.